Rep. Tom Leonard (R-DeWitt), Rep. Tom Albert (R-Lowell), Rep. Tim Kelly (R-Saginaw Township), Sen. Phil Pavlov (R-St. Clair), Sen. Arlan Meekhof (R-West Olive) look on as Gov. 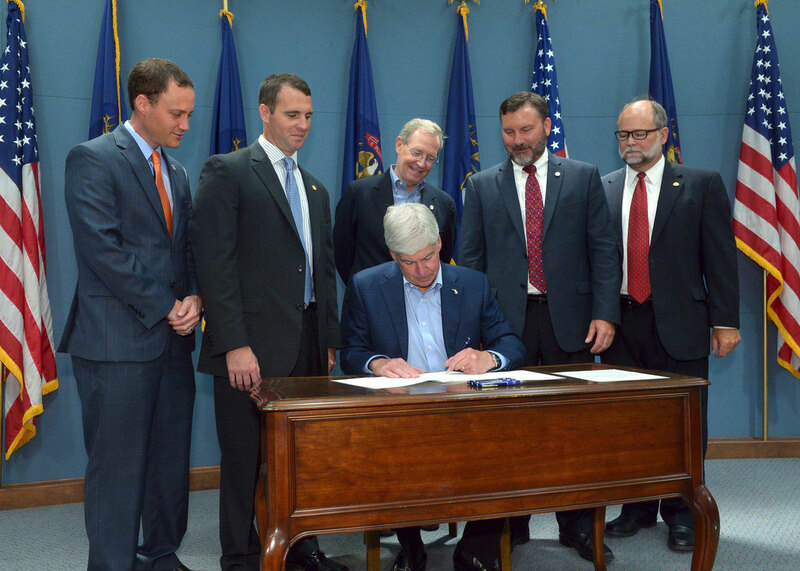 Rick Snyder signs historic pension reform this July. State and local governments across the country owe their employees and retirees billions more in pension benefits than they’ve saved to pay for them. To fix this problem, governments should stop offering benefits that can become an albatross around their necks. Pensions are supposed to be prefunded: When an employee earns a dollar worth of pension benefits, the employer sets aside a dollar to pay for it. That dollar is invested, grows, and is used to pay that employee’s pension upon retirement. Managers need to figure out how much they need to set aside today to pay for future benefits. This requires assumptions about what an employee earns and how much investments will return. These assumptions, in turn, determine how much employers need to put in the pension system. This is different from Social Security, where the government sets both the payroll tax rates that fund the program and the rules for payouts. The taxes aren’t invested; instead, they go directly to pay out retirees and others. Social Security thus requires a constant flow of new people who can provide the money that will be used to send out checks. A prefunded system like a government pension system, however, doesn’t need new members to function. What it needs is a government that will use accurate funding assumptions and make the necessary payments into the pension fund. But the temptation to spend money elsewhere is too strong for politicians. They can use optimistic assumptions to lowball how much they need to pay in, or they can simply not pay in what they should. Both routes free up cash that can be spent elsewhere, which can be used to political advantage. By contrast, there are few political returns to a well-funded pension system. There’s little that can be done to avoid extra costs once pensions are underwater. There are no magic solutions to write off debt. The state constitution protects promised pensions, and governments have a constitutional responsibility to properly fund those pensions. Lawmakers can prevent further debt, though. They can offer new employees plans that don’t allow managers to play games that underfund pensions. That’s what much of the private sector has already done. Employees there don’t have to speculate about what legal protections their retirement funds have against people who make promises for political gain. Instead, they can look at their account balance. Pension debt largely involves benefits that will be paid a decade or more from now, not this year. Since politicians have short-term concerns, they tend to make fixes that make pensions less generous. That generates some short-term savings. But it does not stop future pension debt from piling up because it doesn’t tackle a major factor behind pension underfunding: overly optimistic assumptions about investment returns. Fortunately for Michigan residents, lawmakers here have resisted the temptation to make only token reforms to pensions systems, which has made them national leaders in preventing underfunding. People who entered state employment since 1997 and employees in the large, state-mandated school system are offered benefits that limit government’s ability to kick the costs of current service onto future taxpayers. They can participate in plans where the government pays cash upfront into a retirement account — one that they control. For those school employees that opt for pension benefits, the state will use less optimistic investment assumptions, and employees are responsible for paying half of any underfunding, should it arise. There are still problems left to fix. Local government pensions and retiree health care benefits are a grab bag. Some governments have funded them; others have not. Overall, there are still billions pledged that have not been saved, and local officials should take this failing as seriously as state officials have. Most politicians are crossing their fingers, hoping that the market will fix this problem for them. Because the future is uncertain, there is always a chance that this might happen. But hoping for tomorrow to be better is not a prudent way to manage pension funds that thousands of people rely upon. That’s why Michigan lawmakers deserve credit for moving to a system that will prevent the state from going deeper into debt to its own employees.